BACK - The Story NEXT - Westward, Ho! East Hampton was the first English settlement in what is now New York State. It was established in 1639 when Lion Gardiner bought an island, today known as Gardiner's Island, from the Montaukett people. 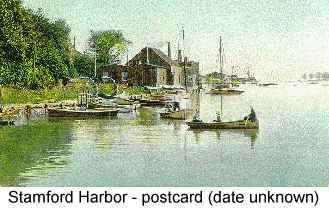 On June 12, 1640, several Puritan families from Lynn, MA, landed in what became Southampton, and some of them migrated to East Hampton. "Puritans" were also called "dissenters" or "nonconformists" in England. They were Protestants who disagreed with the direction the Church of England began to take in the early 17th. century. At that time the Church had adopted some of the principles of John Calvin, a French preacher who spent much of his life in Switzerland. However, when Charles I became king, and, therefore, Supreme Governor of the Church of England, he began moving that church's practices back toward the "high church" rites that came from Roman Catholicism. Charles is sometimes said to have promoted Catholic doctrines as well as practices, but he was theologically more inclined toward Arminianism, which was a variant of Calvinism, though not the one that English Church members had gotten used to. At any rate, this didn't sit well with many of Charles' subjects, and in those days people were willing to imprison, torture, or kill each other over issues such as whether congregants should sing in church, or whether incense should be used. Charles gradually tightened the screws, taking civil rights away from people who weren't members of the Church of England, requiring use of the Anglican Book of Common Prayer in all churches (which radical Puritans considered "too Catholic"), and eventually prosecuting nonconformist leaders and punishing them by pillory, whipping, cropping, and prison. However, various noncomformist congregations continued to operate in secret. The nonconformists were not a homogenous lot; they tended to fight among themselves over doctrine or privilege. Having left the Church of England, they would set up their own churches, then fire the preacher for disagreeing with them. The preacher would take some of the congregation with him and form yet another church. Eventually some of these preachers and their followers decided they would be both safer from the King, and better able to hold a congregation together, in the wilderness of America, which is how Jonathan's probable ancestors got here. Crossing the ocean did not make these people any less contentious, though. They continued feuding and splitting up after they arrived, which is likely one of the reasons why the settlers moved from Lynn to East Hampton. That group held church services in one of their homes until they decided to build a meeting house, in 1652. This church may be the forerunner of today's First Presbyterian Church of East Hampton, which claims to have existed for over three centuries. Both the Presbyterian and Congregationalist sects derive doctrine, but not organizational principles, from Calvin. It is possible to construct a very reasonable, even quite probable, scenario for Jonathan's ancestry. But there are enough gaps and questions in the official record that we cannot say conclusively that this scenario is correct. You can read about it here. We don't have a birth date for Jonathan, which is why we say he was "probably" born in 1711. It was not uncommon in those days of high infant mortality for families to wait until they were pretty certain a child would live before performing a "christening" or baptism. We know for sure, though, that he was baptized in East Hampton by Nathanial Huntting, the second pastor of the East Hampton meeting house, on October 28, 1711. "28 Oct 1711 - Jonathan - George Dibbles - child"
This is the only official record we have for who Jonathan's father was. There are other candidates, but since this is an official record, and the other possibilities have no such documentation behind them, I have accepted that Jonathan's father was a man named George. We don't know anything about Jonathan's early years or how he came to be in Stamford. His father probably remained on Long Island; he appears to have died in Huntington in 1741. In any event, Jonathan next appears in official records on November 11, 1736, when he married Sarah Jessup in the Stanwich Congregational Church in Fairfield County, CT. This church was established in 1732 as an offshoot of the Stamford church by a group of parishioners that included a man named George Dibble, who may have been Jonathan's second cousin. It was more than a church, however, it was a parish, which effectively established it as a separate town, though it is part of Greenwich, CT today. It had its own militia, and in 1734 this George was named a Captain in it. George Dibble, born December 2, 1740, in Stamford. By 1747 Jonathan was a Lieutenant in the Stanwich militia. He was probably also a successful potato farmer. According to Doris Finch Watson, a historian quoted in a June 2004 article in the Stamford Advocate, "the Dibbles and their neighbors were so productive that, for decades, they controlled the price of potatoes in the New York market." Members of Jonathan's family may also have made shoes. In the same article, Watson said, "At night, whole families would sit around kerosene lamps to work on shoes to make extra money. They would bring the shoes to the store and get credit against their accounts to buy kerosene, sugar, coffee, tea, whatever they needed. They paid in shoes instead of cash." Jonathan was also a significant land owner. The Reverend Henry Griswold Jesup published a family history, Edward Jessup of West Farms, Westchester Co., New York, and His Descendants, in 1887. (Two of Jonathan's daughters and one of his sons married Jessups.) According to Jesup, Lieutenant Dibble owned land on the west side of Chatham Square in New York City and "held a lease of the premises in the Bowery, known as the 'Bull's Head Tavern.'" 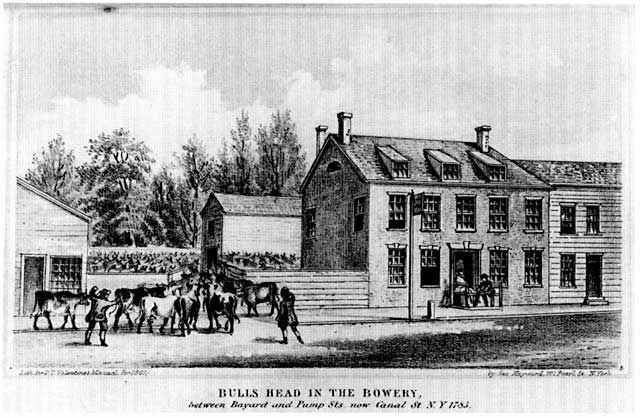 The Bull's Head was a famous--or infamous--bar. Difficult as it is to imagine today, the place was a spot where cowboys driving herds of cattle to market would stop to relax, get some drinks, and party loud and long into the 18th. century night. The man who built it, in around 1750, was Richard Varian. He may have been a younger brother of the James Varian who married Jonathan's daughter Deborah. Jonathan also owned land on the Hudson River in Wallkill, near Poughkeepsie, NY. And Jesup reports that, "In consequence of the small-pox becoming epidemic, probably about 1760," he sold his New York City holdings and bought a large farm that straddled the NY-CT line, with parts in Bedford, NY and parts in Stamford, CT. His official residence seems nearly always to have been in Stamford, as four of his five children are recorded as being born there, including his only son George. However, Reverend Jesup says that this George, from whom our line is descended, was actually born in the Bull's Head Tavern. Since Jonathan was the landlord, this at least seems possible. But, since the bar was built around ten years after George is said to have been born, it also seems ... apochryphal. Jonathan also had a brief career as a politician. He represented Stamford in the General Assembly of the Colony of Connecticut in 1758. 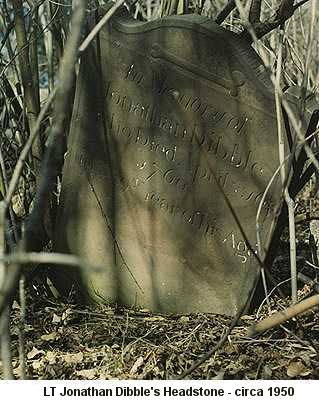 Soon after buying the Bedford farm, Jonathan ... well, bought the farm, on April 17, 1760, and was buried in Brush Cemetery, Stamford, Fairfield, CT.
On June 20, 1762, his son George Dibble married Phebe (also spelled Phoebe) Jessup. Now, a word needs to be said here, though it's not clear which word that should be. Phebe is reported to be George's cousin, though the available data on this connection is very confused and may be erroneous. In any event, the Dibbles were apparently in very deep with the Jessups for at least two generations. However, this sort of thing does not seem to be unusual in genealogy. We also have a Thomas Dibbel/Dibell/Dibble marrying a Hannah Jessup in the Hamptons on Long Island around 1690 (about 20 years before Jonathan was baptized there). All of these children were baptized by the Reverend Ebenezer Dibblee at St. John's Episcopal Church in Stamford. He was the pastor there for 51 years before he died in 1799. Reverend Dibblee, a descendant of Robert Deeble, changed the spelling of his name because he had heard that the origin of the name might have been the French word for "devil". Notably, this is not the Calvinist Congregational Church a few miles up the road in Stanwich, which Jonathan's second cousin George Dibble helped establish. During the Revolutionary War, some of the Connecticut Dibbles, including Reverend Dibblee, were unquestionably Tories, supporters of the Crown. During Major General William Tryon's raid on Danbury, he used as his headquarters the home of Nehemiah Dibble, Jr., which, it was said, was not burned later by the British because of the owner's pro-British sympathies. Nehemiah was a Robert Deeble descendant through the King Philip's War hero Ebenezer Dibble. According to the Rev. Jesup, George, son of Jonathan, "did not take up arms on either side", but George's first son named Jonathan was a loyalist. In this he was rather unusual. Current research indicates that about half of the white males in the thirteen colonies tried to remain neutral, and only about 15% to 20% of white males were self-declared "loyalists". Active support of the revolution was similarly limited. (The opinions of African-descended slaves and freed people, and of women, were, not surprisingly, not recorded.) This Jonathan was a surgeon in the British navy, and he showed courage by trying to visit his father during the war. He went out riding and was nearly killed by American soldiers, but was rescued by an officer who was a friend of the family. Later he was taken prisoner when his ship was captured by an American privateer. After the war, like many Tories, he moved to Canada. Soon after that, on November 26, 1784, he went out hunting and got caught in a blizzard. The young man died, Jesup says, "within a half-mile of his own door." Although many CT Dibbles served in the War of 1812, it seems that none of George's sons did. George Dibble died on April 19, 1813, and is buried in "Bush Yard, Stanwich, Fairfield, Connecticut". This is the same cemetery where his father Jonathan was buried, a private cemetery near the actual village of Stamford, which, as Reverend Jesup reports, later became part of the farm of one "John H. Brush of Stanwich". From 1760 to 1828, they [the Dibbles] buried their dead in what must have been unused farmland. In years when there was money, tombstones were carved to mark the graves. Otherwise, survivors found fieldstones shaped like tombstones, flat and rounded at the top, and planted them upright at the head of graves. The Dibble cemetery is surrounded by a wall made of stones so perfectly placed they needed no cement. Though the wall is set in the rises and dips of the land, the top is level. It has an entrance where a delicate, arched iron gate still is half-hinged, the latch frozen by rust. "They were real artists," said Peggy Bunnell, who has lived near the cemetery since 1944. "At one time, this was a very handsome cemetery." Tombstones for Dibbles named Sarah, Eliza, Jonathan and George lean 45 degrees, most of the writing worn away or crusted with olive-green moss. 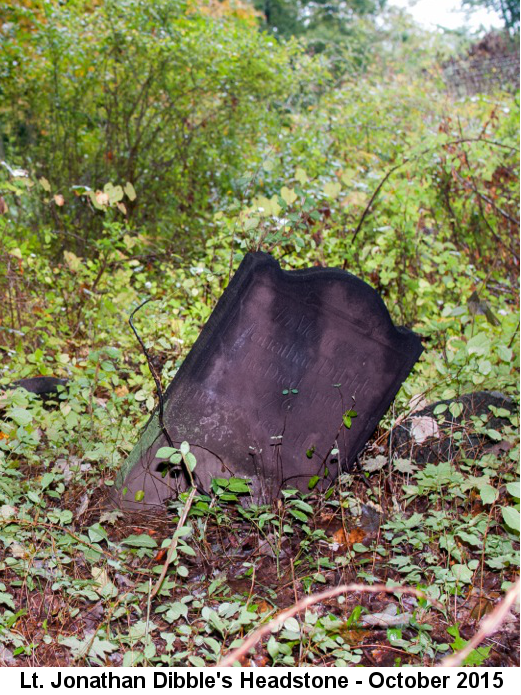 Thick, dead vines hang from the trees like a curtain, fallen tree limbs crisscross the graves and weeds creep up the chipped faces of the tombstones. George's son Samuel was born on August 2, 1764 in Stamford. He married Hannah Platt sometime around 1786 or 1787. Hannah was the granddaugher of Samuel's great-grandfather's ward, Benoni Platt. 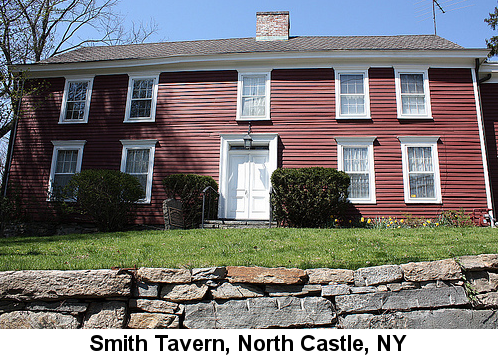 The Platts lived in North Castle in Westchester County, NY. This area was just north of the CT-NY border and was part of the Town of Bedford in Lt. Jonathan Dibble's day. Hannah was born somewhere between 1748 and 1762, making her older, perhaps considerably older, than Samuel. Together they had one child, Hannah Platt Dibble, born April 11, 1788. Hannah Platt Dibble married Gabriel Hubbard of New York City in February 1811 in the Stanwich Congregational church. Samuel and his family most likely lived in North Castle. Elizabeth and George may have been twins. Two sons named Ingersol(l) in the same family do not seem to be a mistake, nor, as best we can tell, did the first one die before the second one was born. Samuel had a large household. In addition to his wife and children there was at least one slave, and, at times, other people characterized by the census as "Foreigners not Naturalized". Samuel and Deborah's daughter Elizabeth died on December 6, 1827, apparently unmarried. She was buried in the Brush Cemetery on Lt. Jonathan Dibble's old farm in Stanwich. In the 1830s Deborah and some of their children journeyed to Indiana. As for what became of Samuel and the remaining children, we just don't know. They may also have had other children named Sarah, Charles Henry, and Samuel. Very little is known about Jonathan or his family. Mary Ann may have married Eliphalet Platt, a medical doctor who was born in 1797, and settled in Rhinebeck, NY. Of Ellen and her mother, as well as of these other children, we shall hear more later as we move west.